Published at 5:09 a.m. ET: One of the best-known child kidnapping cases in the country is back in the news. San Francisco Police Chief Greg Suhr held a news conference Wednesday to announce they now have a "person of interest" in the 1984 disappearance of 10-year-old Kevin Collins. He was last seen walking home from a basketball game and has not been since. His face was one of the earliest to be put on the back of milk cartons across the country in the search for missing children. "This case is a case that haunts the San Francisco Police Department," Suhr said. 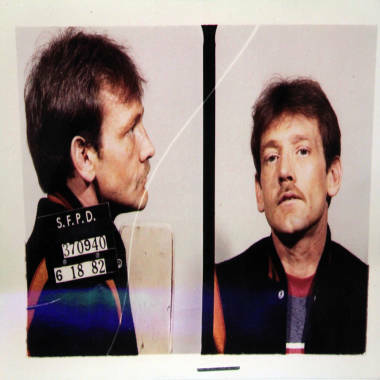 Suhr identified the man as Dan Therrien, who lived in a home just a couple of blocks from where Kevin was last seen in 1984, near the corner of Masonic Avenue and Page Street in the Haight-Ashbury neighborhood. Therrien died in 2008. Complicating matters, Therrien went by at least five aliases. Police said he used the name Wayne Jackson at the time of Kevin's disappearance. San Francisco Police Chief Greg Suhr held a news conference Wednesday to announce a "person of interest" -- Dan Therrien, shown in 1982 -- in the 1984 kidnapping of 10-year-old Kevin Collins. Police stopped short of calling him a suspect, and instead said he was a "person of interest." Suhr also asked for the public's help in coming up with any information that might be relevant to the case. At the conference, police said that detectives realize this is a long shot, but they're just hoping someone will remember him. Investigators looking at the case recently realized Therrien had a lengthy criminal past in both California and Canada, including a felony for a lewd act on a child. They didn't know that at the time because he had used other names. Police said that in 1981 he had served six months in jail after pleading guilty to a felony charge of a lewd act on a child. The victim was 7 years old. The Canadian case was also previously unknown: He was arrested in 1973 on suspicion of kidnapping and sexually assaulting two 13-year-old boys. In the Canadian case Therrien -- whom police also identified Wednesday as Wayne Jackson -- went on the lam and was never arrested. Police didn't release where it happened in Canada or any other details. Therrien was eyed by police at the time of Kevin's kidnapping, according to sources, and he had consented to a search at the time. But he was never formally arrested or named a suspect in Kevin's disappearance. Kevin's story captured national attention. He was last seen was on his way home from a basketball practice at St. Agnes School in the Haight-Ashbury neighborhood. He was talking to a man with blond hair and a large black dog, waiting for a bus at the corner of Oak Street and Masonic Avenue. Normally his older brother would have been with him, but that day his brother was home sick. Police said Therrien matched the general description of that man and had a black dog at the time. Last month, San Francisco police searched the home where Therrien lived in 1984 and removed several bones that were located under concrete in the garage. But those bones turned out to be from a small animal. Cold-case investigators said last week that they realized recently that cadaver dogs were never used when the home was searched in the 1980s. On Tuesday night, the the lead cold-case investigator visited the home of Kevin's mother. Investigators spent a couple of hours with the boy's family and left without comment. They said they showed the family photos of Therrien at the time Kevin went missing to see if they family might have known him. Kevin Collins would have been 39 years old on Jan. 24. "What we're looking for now is anybody that saw this guy in 1984, anybody that talked to this guy back in 1984, anybody that talked to somebody that talked to this guy back in 1984," Suhr said. "We would love to find the whereabouts of that little boy." Anyone with information on this matter can contact the SFPD Major Crimes Unit at (415) 553-1145. Information can be given anonymously at (415) 575-4444.